Pablo Picasso (1881 – 1973) Spanish painter, sculptor, ceramicist and poet. Picasso was a founder of Cubism and one of the most influential artists of the Twentieth Century. Picasso was an influential peace activist whose art touched on the horrors of war. Pablo Picasso was born in Malaga, Spain in 1881 to a conventional artistic family. From an early age, he displayed a talent for painting and began displaying his work from the age of 14. To further his artistic aspiration he left Spain for Paris where he became part of a new avant-garde movement of art. His early artistic career went through various states. One of the first stages was known as the ‘Blue Period.’ In his late-teens his paintings were dominated by different shades of dark blue; they were also often melancholic. This included a famous self-portrait where Picasso looked much older than his 20 years. In 1907, Picasso continued his artistic experiments and took inspiration from African art. This led to an early form of cubism and also one of his most controversial paintings – ‘Les Demoiselles d’Avignon’ – it is a picture depicting five prostitutes in a brothel. It is an eye-catching and an original exploration of modernism in art, but when displayed in his studio the reaction from art critics was strongly negative. 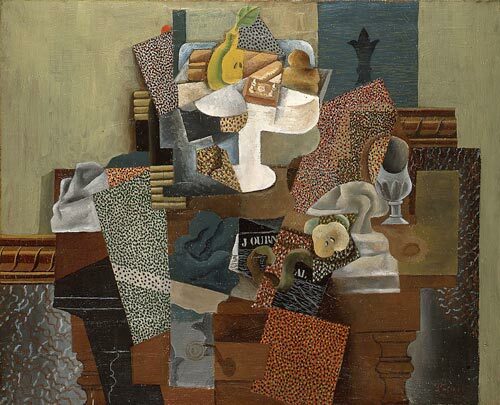 In the years before the First World War, Picasso – along with artists such as Georges Braque – continued to develop a new form of painting known as ‘cubism.’ Cubism involved capturing the essence of the subject on the canvas but exaggerating certain features. The colours were invariably dull – greys, brown and neutrals. In 1914, Picasso was living in Avignon with fellow artists. His French artist friends were called up to the army, but he was able to continue painting during the war. However, the German-born Kahnweiler was exiled from France and Picasso was left without a dealer. In 1918, Picasso married ballerina Olga Khokhlova. Shortly after he began a fruitful relationship with the French art dealer Paul Rosenberg. Rosenberg became good friends with Picasso and helped the couple settle in Paris, giving Picasso a new artistic social circle. Paris was considered an artistic hotspot of the ‘Roaring Twenties,’ attracting many innovative artists. Picasso and his wife Khokholva had a tempestuous relationship. 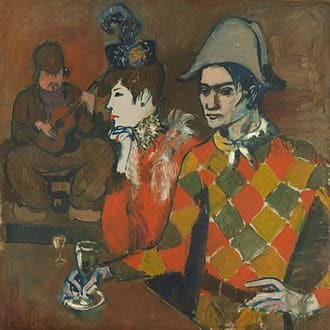 Picasso’s bohemian nature clashed with the social graces of Khokhlova. They remained married until 1955, but Picasso had several affairs and mistresses. In the 1920s and 30s, Picasso concentrated on more classical works of art. He became interested in depicting the human form in the style of neo-classical. To some extent, he was influenced by artists such as Renoir and Ingres, although he always retained a unique and individual expression. Picasso had an instinctive and natural compassion for those exposed to suffering, especially if it was as a result of injustice. His natural sympathy and desire for equality led him to join the French Communist party. During the Spanish Civil War, he supported the Republicans and nursed an intense dislike of Franco and what he did to Spain. Picasso was so enraged with Franco that he never allowed the painting to go to Spain during Franco’s lifetime. It eventually reached Spain in 1981. Picasso was well aware of a political dimension to art. Another key painting of Picasso was his simple bird drawing a symbol of peace. Picasso donated it the Soviet-backed World Peace Congress of 1949. It was telling of a new phase in Picasso’s art – the power of simplicity. 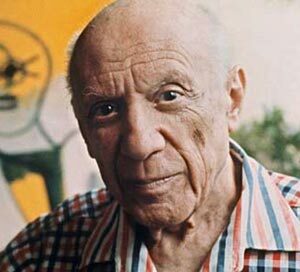 Picasso was a member of the French Communist Party until his death. Abundant in artistic inspiration, Picasso was remarkably prolific. His total artistic work numbered close to 50,000. This included 1,885 paintings; 1,228 sculptures; 2,880 ceramics, and roughly 12,000. He died at the age of 91.